Is your honda suffering with heavy steering? Either one way or in both directions? Or maybe the steering is not self-centering anymore – these are just some of the most common issues our customers are faced with when the Electronic Power Steering rack and motor fails on the Honda CR-V. The Honda CR-V uses a modern Electric Power Steering (EPS) system which consists of an electric power steering rack, ECU and motor. The system is connected to the steering column (shaft) which is fixed to the steering wheel at the user-end. Below we have listed some of the most common faults we have seen with the Honda CR-V electric steering unit. 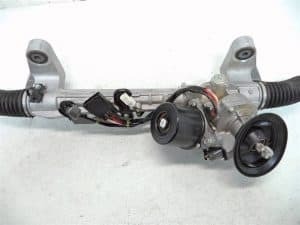 If your Honda CR-V electric steering unit has failed, your garage or dealership may advise that the unit is not one they can repair and will require replacing at a very high cost. New replacement units come with a standard 12-month warranty and will also require coding to program the units to match the coding of your vehicles on-board systems and this comes at an additional cost. A second-hand used part in most cases would come with a limited 30-day warranty and will also require re-programming to overwrite the vehicle data stored in the memory. My Honda CR-V Has An Electric Power Steering Rack fault, How Can Power Steering Services Help? Here at Power Steering Services, we are able to bench test and repair almost any faults with the Honda CR-V Electric Power Steering Racks. When rebuilding the electronic steering rack / motor we use genuine OEM components and also uprate components where possible to strengthen the units where there may be known weaknesses. All units are rebuilt to meet & exceed OE specifications and the repaired steering rack is returned to you with a Lifetime warranty and is set up to be fully plug & play, meaning no programming is required when refitting to the vehicle. If you have a Honda CR-V with a suspected Electric Power Steering fault then call us today on 0208 853 3343 for a diagnosis or even just some friendly advice! Tags : Honda CR-V Electric Power Steering Rack Fault, Honda CR-V Electronic Power Steering Failure, Honda CR-V EPS Problems, Honda CR-V Steering Rack Repairs.